This year's Book Expo was mild to say the least. Less foot traffic which probably translated to less attendees registered but also very much so on the lower side of exhibitors with an emphasis on the Big 5 and other mid-sized/larger publishers that could afford the real estate. So what does that mean going forward as we see one of the largest U.S. trade shows slim itself and also give priority to those who can pay? Making my way to the next landing I saw the largesse of an oil painting of the Pawnee Table Creek Treaty of 1857 by William Haskell Coffin. In this painting, Native American men dance in an open field wearing nothing more than headdresses and loincloth of sorts. Some carry hatchets, others spears. The settlers, all white, stare stone faced, dare I say questionably, at those in celebration. The imagery itself disturbed me knowing the broad strokes of the history between colonialists and Native Americans (short version, the first group steadily massacred the second). 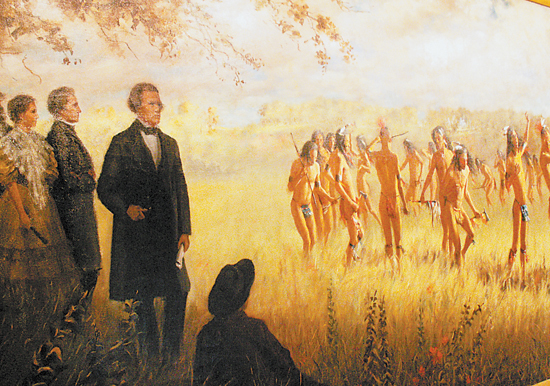 On a table to the far right of this painting was a copy of the actual Pawnee Treaty of 1857. If the visual didn’t incite pause, the treaty itself had me stupefied.